Silent Lion as Four: John Saunders on Irish Bouzouki, Barbiel Matthews-Saunders, guitar and vocals, plus Michael Manderen on viola da gamba and Rio Blue on cajon. The Minstrel Stage at the Great Lakes Medieval Faire, photo courtesy of Eric Silva. 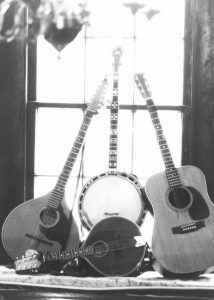 Over the years Silent Lion has performed everywhere from folk festivals to bookstores to concert venues, including Severance Hall in Cleveland. We’ve performed for Akron First Night for many years, and for medieval dinner theaters, church concerts, and arts festivals. 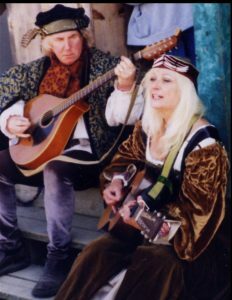 Fans have found us regularly performing at Renaissance and Medieval Festivals in the eastern U.S. 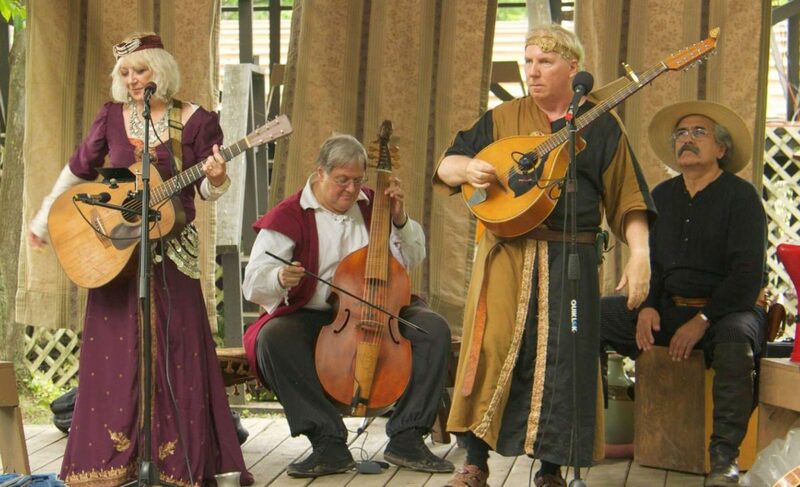 In recent years our friends Michael Manderen (viola da gamba), and Rio Blue (percussion), have joined Silent Lion at the Great Lakes Medieval Faire and Michigan Renaissance Festival. Last year at Great Lakes Medieval Faire Josh Amyx, (percussion), delighted us and fans by joining Silent Lion. We count ourselves lucky to have such talented friends contribute their gifts to our music. April 27, Saturday, 11-3pm Wine Tasting at Kroger on East State Street, Athens, Ohio. May 25th, Saturday, 11-3pm Wine Tasting at Kroger on East State Street, Athens, Ohio. June, 22, Saturday, 11-3pm. Wine Tasting at Kroger on East State Street, Athens, Ohio. July 13, Saturday to August 11, Sunday. Great Lakes Medieval Faire, Rt 534, Rock Creek, Ohio. Every Saturday and Sunday for five weeks! 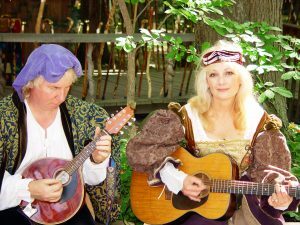 Come see Silent Lion joined by Michael Manderen at the Minstrel Stage, in the magical woods of our medieval village of Avaloch! October 19th, Saturday and 20th, Sunday. Rosenvolk German Medieval Faire, Ferdinand, Indiana. New this year: our friend Michael Manderen joins us! October 26th, Saturday, 11-3pm. Wine Tasting at Kroger on East State Street, Athens, Ohio. October 26th, Saturday, 7:00-8:30pm. The Federal Valley Resource Center. Rt. 329, Stewart, Ohio. June 23, Saturday, 11-2pm. Wine Tasting at Kroger on E. State St., Athens, Ohio 45701. June 28th, Thursday. 5-8pm. Beer Tasting at Kroger Marketplace, Newark, Ohio. July 14-August 12th, every Saturday and Sunday, 11-7pm. THE GREAT LAKES MEDIEVAL FAIRE. Rt. 534, Rock Creek, Ohio, 44084. Aug. 18-Sept. 30, every Saturday and Sunday plus Labor Day Monday and Friday Sept. 28, 10-7:30pm. THE MICHIGAN RENAISSANCE FESTIVAL, 12600 Dixie Highway, Holly, Michigan, 48442. Aug. 23, Thursday. 3-6pm. Beer Tasting at Kroger on E. State St., Athens, Ohio 45701. Aug. 30th, Thursday. 5-8pm. Beer Tasting at Kroger Marketplace, Newark, Ohio. Sept.20, Thursday, 3-6pm. Beer Tasting at Kroger on E. State St., Athens, Ohio, 45701. October 6, Saturday. Private bonfire party, somewhere in Ohio. YEA! October 13, Saturday. Concert at the Federal Valley Resource Center, Rt. 329, Stewart, Ohio. 7pm-8:30. October 20, Saturday, and 21, Sunday. Rosenvolk German Medieval Festival, Ferdinand Park, Ferdinand, Indiana. May 25th, 3-6pm. Beer Tasting at Kroger on E. State St., Athens, Ohio 45701. June 17, 11-2pm. Wine Tasting at Kroger on E. State St., Athens, Ohio 45701. June 22, 3-6pm. Beer Tasting at Kroger on E. State St., Athens, Ohio 45701. July 13, 3-6pm. Beer Tasting at Kroger on E. State St. Athens, Ohio 45701. July 20, 5-8pm. Beer and Wine at Kroger on N. 21st St., Newark, Ohio 43055. July 27, 3-6pm. Beer Tasting at Kroger on E. State St., Athens, Ohio 45701. July 8- August 13th, 2017. The GREAT LAKES MEDIEVAL FAIRE. Every Saturday and Sunday, all day! Located Rt. 534, Rock Creek, Ohio 44084. August 19th-October 1st. The MICHIGAN RENAISSANCE FESTIVAL. Every Saturday and Sunday, plus Labor Day and Last Festival Friday. From 9:30am – 7:30pm! 12600 Dixie Highway, Holly, Michigan 48442. October 26, 3-6pm. Beer Tasting at Kroger, E. State St., Athens, Ohio 45701. October 28, 11-2pm. Wine Tasting at Kroger, E. State St., Athens, Ohio 45701. November 9, 3-6pm. Beer Tasting at Kroger. E. State St. Athens, Ohio, 45701. November 25, 5-6pm. Holiday Music at the Market on State. Athens, Ohio 45701. December 9, 3:30-5pm. Holiday Music at the Market on State. Athens, Ohio 45701. December 16, 3:30-5pm. Holiday Music at the Market on State. Athens, Ohio 45701. December 21, 3-6pm. Beer Tasting at Kroger, E. State St., Athens, Ohio 45701. December 30, 11-2pm. Wine Tasting at Kroger. E.State St., Athens, Ohio 45701.